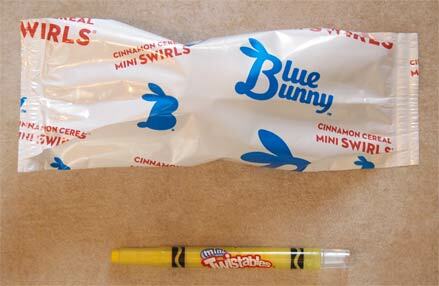 The treat isn't nearly as big the wrapper suggests. See those delicious looking crumbs up on top there? Yeah, they are indeed pretty delicious. They are also pretty crunchy and you know I love my crunch. With every bite I was thinking I wanted to just eat the whole box. 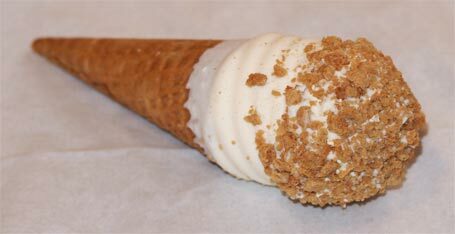 Oh how I love my crunchy cereal, and now it's on top of an ice cream cone. There's a funky coating up top too. It says it's just vanilla flavored but when mixed with the cinnamon cereal it comes together with a neat sweat pop to it. I continue on to the crunchy cone. I love crunchy cones. Yeah, this photo didn't work so well. Sorry about that. And then it's gone. My only mild critique is that the cinnamon flavored ice cream does have a little kick to it. By that final bite, it has built up a little bit of something to it. I won't call it fireball kick, but I'll need another cone or two to try and quantify how it tastes. I'm going to call that a great first impression. Those really look good! 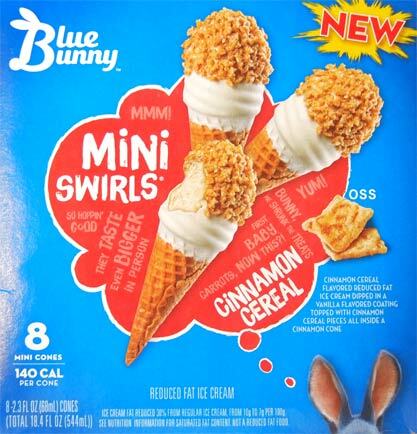 Hopefully I can find them by me as not all the stores carry a full line of Blue Bunny things. "Vanilla Flavor" I tasted this revised version and the flavor is so dull, and muted. I called BB customer service and complained about it and she said they would speak to their marketing department about it. I wonder if you might inquire about this change...there have to be many unhappy customers, I know I won't be buying this any more since they changed it and ruined a great all natural ice cream. VERY SAD! Companies need to either raise prices or skimp on ingredients, and as you probably noticed, the price of ice cream (in general) hasn't changed a ton. I'm sorry they ruined it on you. The price of real vanilla has skyrocketed like 500% - 600% over the past year due to shortages. I can't say for sure that BB will ever revert to the real thing, but surely the prices will come down eventually. ingredient label readers and they'll stop buying too. So while BB may save a few pennies on each tub of ice cream, they're going to lose a lot more in lost sales. I'm willing to pay a bit more for the increase in cost of ingredients as are most folks that buy this specific flavor of their ice cream. Maybe they'll change their mind on this one. I don't see why it is that hard to just bump up the price for a specific flavor, but who knows. Thanks again friend for responding! I enjoy your site! Thanks for that information, so it makes more sense they might try and use artificial vanilla flavor...however with this specific flavor most of the consumers are pretty picky and do read the ingredient labels and many folks have been very loyal to this flavor because of the fact that the ingredients were all natural and of course the product tasted amazingly good. BB is going to lose many of those buyers because of that change, so the question is was it worth it to delete the natural vanilla extract if they lose most of the buyers? BB should have just increased the price of that flavor to account for the increase in the price of vanilla and most buyers would have gladly paid it. Now it's too late for that most likely. Heck if they felt they needed to communicate with consumers they should have put out a tweet or fb comment on the matter, if a company explains a price increase without changing the quality or ingredients of the product many buyers will continue to purchase the items. But again thanks for commenting, Me.